At your request, I conducted various acoustical tests on October 17, 2008 associated with Urban Outfitters ‘Acid Bath’ Lecture Hall at its corporate headquarters in Philadelphia. The space was intended for various presentations including amplified speech as well as media presentations, but there are problems with slightly excessive reverberation within the space as well as sound from the adjacent café which intrudes into the hall. In addition, amplified sound from the hall intrudes into two adjacent conference rooms which can interfere with meetings in those rooms. Reverberation in a space is caused by sound produced in that space reflecting back and forth between reflective surfaces. The greater the amount of reverberation, the lower is speech intelligibility, particularly the farther away from the sound source. The introduction of other noise, such as HVAC noise or in this case, sound from the café exacerbates the speech intelligibility problem. These reverberation times are slightly high for a hall intended for speech and other presentations. The design RT60 value (at 500 Hz) for such a hall is typically one second, and since the measured value is only 0.2 seconds higher, 1) the effect of reverberation on speech intelligibility is not serious, and 2) only modest acoustical treatments will be required to reduce the RT60 to one second. Acoustical absorption treatments, such as the Tectum on the ceiling of this space, would be installed in order to reduce the amount of reflected sound energy as well as reduce the RT60. Other absorption treatments could include fiberglass panels covered with acoustically transparent fabric, or heavy sound absorbent drapes. Sound from patrons as well as noise from kitchen equipment enters through the rear of the hall through the large open entrance into the café, and through the 4’ gap at the top of the wall which is along the entire side wall abutting the café area. Measurements of café noise were performed at the rear of the hall and at various other locations throughout the lunchtime hours. In general, these noise measurement values were relatively consistent between each other. Figure 1 shows the results of these measurements. 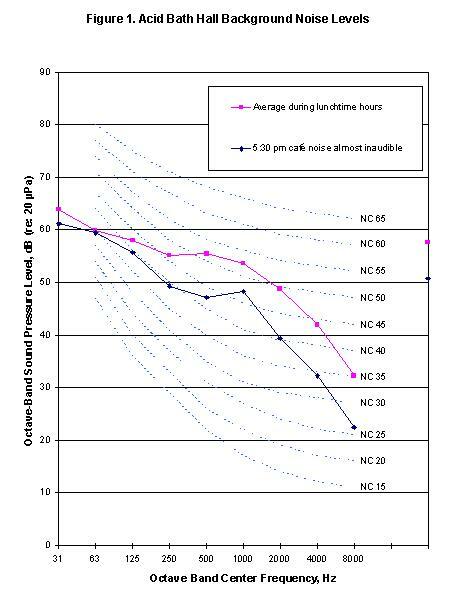 The recommended Noise Criteria (NC) curve for this hall is 35, and as can be seen by this figure, during lunch time café noise causes this hall to be at NC 50, which is much higher than NC 35. Since speech interference also occurs at higher NC values, it is clear that the main problem with this space is infiltration of café noise. Café noise consists of patron noise, the sound of compressors for cooling beverages, and banging of lunch trays on the metal storage racks located near the entrance to the hall. A very low (or no) cost noise control solution would be to relocate the storage racks to a less noise sensitive area. By 5:30 pm, café noise had dropped to the point where it was only occasionally bothersome in the hall. Noise measurements taken at that time (and shown in Figure 1) indicate that levels dropped by about 7 dBA, to 51 dBA. As can be seen by Figure 1, that situation corresponds with NC 45, which is still much higher than the desired NC 35 target. After café noise had subsided, other noise sources such as the projector became noticeable. I suspect that the peak at 1000 Hz in Figure 1 is due to projector noise, and if the projector were off, the resulting noise level would be around NC 40. NC 40 would likely be an acceptable goal for this space. Elimination of café noise would result in a 7 dBA improvement which would be very noticeable (a 10 dBA improvement is considered to be a 50% reduction in perceived loudness). Please note that while I was measuring noise during lunchtime hours, the overall noise level of 58 dBA did not vary much throughout the hall. This strongly suggests that a significant portion of the café sound infiltrating the space is coming through the 4’ gap near the ceiling. Consequently, it is likely that sealing off only the wall partition leading into the hall will not completely eliminate café noise. I developed a simple room acoustics computer model, which takes into account room dimensions, and architectural finishes to calculate reverberation time as a function of frequency. The model overpredicted reverberation time, so I used measured reverberation time to adjust the sound absorbing characteristics of particular wall and ceiling finishes. This calibrated model allows the evaluation of acoustical scenarios with respect to potential sound absorbing treatments. Since the existing RT60 is not that much higher than the desired goal of 1 second, only modest improvements in sound absorption are needed (please note that sound absorption within rooms is directly proportional to the surface areas of absorbing treatments). That said, a modest reduction in the RT60 will be more difficult to notice. As discussed, the most practical sound absorption treatment in this space might be a retractable curtain along the wall facing the parking lot. The curtain would need to cover the entire wall, from ceiling to floor, and would need to consist of a heavy fabric. For the purposes of this analysis, I assumed 18 oz. heavy velour curtains. This treatment would reduce the RT60 at 500 Hz by approximately 0.3 seconds, to approximately 0.9 seconds. The downside of this approach is that there would be no acoustical benefit when the curtain would be fully retracted. Speech intelligibility is affected by the amount of reverberation and the signal to noise ratio within a space. As noise levels and/or reverberation time increases, speech becomes more difficult to understand. The Speech Transmission Index (STI) varies from 0 to 1, with 0 being the worst speech intelligibility and 1 being the best. Assuming a signal to noise ratio of 3 dB (due to café noise), the STI for existing conditions is 0.47. That is, at the rear of the hall, only 47% of sentences would be understood. With the use of the curtain, the STI would increase to 0.55, which would be a noticeable improvement. Other ways of improving the STI would be either to increase the sound level of the sound system or reduce noise levels within the space. Given the fact that sound system noise is bothersome in the adjacent conference rooms, increasing the sound level of the sound system is not likely a practical option. Reducing café noise, however, would substantially improve the signal to noise ratio, and thus increase the STI. There are two options for reducing café noise within the lecture hall. •	Enclose the 4’ gap at the ceiling and extend the partial rear wall to the ceiling. •	Enclose the 4’ gap at the ceiling, install a door in the opening leading to the café, and fully enclose that partition. The amount of needed reduction in café noise as shown in Figure 1 is on the order of 10 dB which is very achievable with standard construction techniques. Standard wall constructions of 2x4 with two layers of 5/8” GWB would easily attain that amount of reduction as long as all gaps leading into the café are completely sealed (and small cracks sealed with non hardening caulk). Even very small cracks can defeat noise reduction otherwise provided by such treatments. As previously discussed, the cooling fan in the projector appears to be noisy, and may be the dominant noise source once café noise is reduced. It might be possible to put that fan on a timer which would turn the fan off after a specified time needed for sufficient cooling. I understand that noise from lecture hall presentations is bothersome in the two conference rooms adjacent to the hall. While I was conducting noise measurements in the hall, I could readily hear conversations between people in the conference rooms, so it is clear that the partitions between these spaces are not providing much noise reduction. A large percentage of the sound transmission problem is due to sound passing through the 4’ gap in the wall at the ceiling. For the conference room closest to the café, much of the partition consists of polycarbonate which is very lightweight, and allows sound through. Once the 4’ gap is sealed, heavy glass could be installed over the polycarbonate in order to provide additional noise reduction. Laminated glass, ¼” thick, with an airspace of several inches separating it from the polycarbonate, may be appropriate for this application. Standard acoustical practice would be to measure the Noise Reduction (NR) of the existing partition, calculate the necessary additional attenuation, and recommend a treatment which would achieve that amount of attenuation. I measured the NR of this partition, but the data was significantly influenced by sound coming through the 4’ gap, and is therefore not useful for this application. In light of this issue, you could seal off the 4’ gap, and then redo the NR test, or simply install the laminated glass and seal the 4’ gap without the test results. The adjacent conference room also has serious sound infiltration issues due to a) the 4’ gap, b) large cracks around the perimeter of the large wooden door separating the spaces, and c) poor NR of the large wooden door itself. This problem could be addressed in stages by sealing off the 4’ gap, as well as the perimeter cracks, and then assessing the improvements. If further improvements were needed, I would recommend the installation of a fairly massive material, in order to more closely match standard wall construction (i.e., two layers of massive material separated by an airspace of several inches). It may be possible to construct another wood door with an airspace between it and the existing door. Loosely packed fiberglass batt within the airspace would provide a few extra dB of attenuation.